An incident has come in. Time is of the essence in alerting your in-house responders. A station alerting system that leverages the power of the Chief Platform ensures that your responders are alerted quickly every time through both audible and visual cues. Information is key when preparing to respond to an incident. 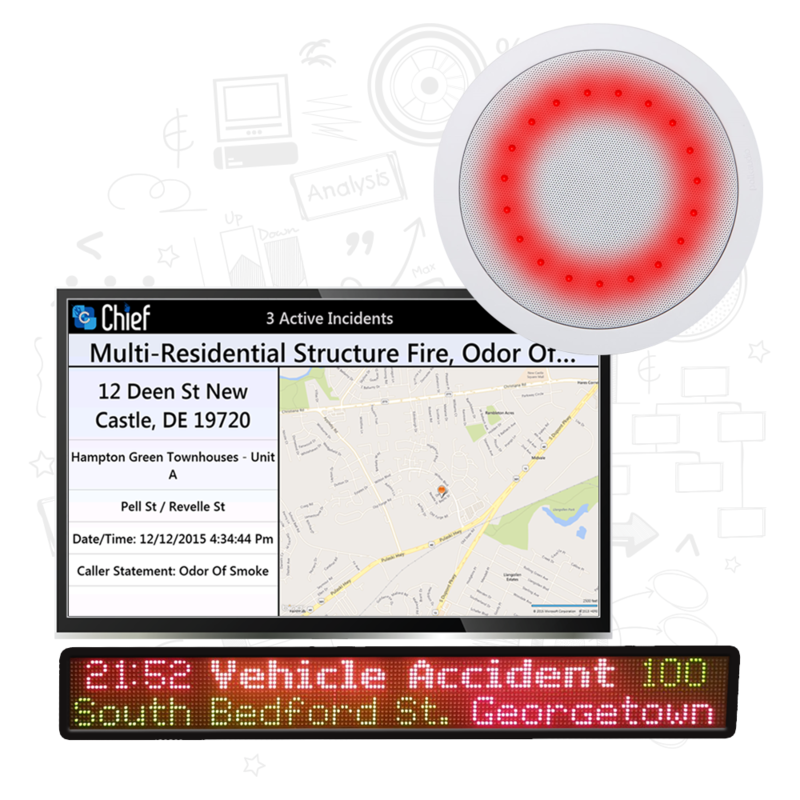 Utilizing Chief Station Alert, your responders can easily get the information they need from text-to-speech announcements, LED signs, TVs, computer screens, and printed reports. We will work with you to custom design an expandable alerting package that fits your needs both now and in the future. Don't pay tens of thousands of dollars on a station alerting system. We leverage the power of the Chief Platform so that you do not have to invest heavily in hardware that may be outdated in a few years. Additionally, we work with you to source local vendors or in-house personnel to install the equipment and wiring to save even further. You can choose from our library of stock sounds or utilize a custom sound effect to notify your responders of an incident. In order to avoid impacts to situational awareness, the system allows for a custom length of time to slowly increase the volume of the alarm. In addition to simple sound effects, we can transform the incoming CAD data into speech to announce what the incident nature, location, cross streets and more. Your responders don't need to fumble around in the dark or waste time flipping light switches. With Chief Station Alert, you can trigger low voltage LED or standard lighting fixtures to come on when there is an incident. This enables your responders to do what they need to do - get ready to respond to the incident. Your citizens expect you to be there when they need you, but communication systems do break down. CAD systems go offline. Networks can crash. Internet outages. Radio Tower got hit by lightning. By using Chief Tone Alert to receive your agency's tones along with CAD data from Chief Messaging, you can have peace of mind that your personnel will be alerted. The system can be configured to automatically utilize tone data for an incident if no CAD data has been received. No two agencies are alike. With Chief Station Alert, we work with you to custom design and build the features you want and need in an alerting system. In addition to the usual audible and visual elements, we can build in customized features such as alerting different zones based on incident nature or time, different sound effects based on incident nature, doorbell notifications, unlock doors, raise engine bay doors and more. If you have an idea for something you want to happen when an incident is received, let us know and we will be happy to discuss how to make it work!